Step into this inner city oasis and make your Auckland stay unforgettable. With its three metre high stud, New-York style architecture and huge outdoor covered garden terrace, Apartment 338 is a rare find in Auckland city. Privately owned, beautifully furnished, sunny AND situated in the Heritage Hotel Apartment complex, you'll enjoy the best of both worlds. Enjoy all the amenities of a top hotel and the space and privacy of a luxury apartment. A rooftop pool, two gyms, indoor lap pool, spa pool/hot tub and outdoor tennis court make this the ultimate luxury stay. North facing, with all day sun, this apartment is set at the back of a huge courtyard, quiet and private for an inner city apartment, yet provides true resort living in the heart of the CBD. Five to 20 minutes walk away you'll find: Auckland Ferry and cruise terminals, Britomart train and bus transport hub, our famous waterfront and Ponsonby's colourful, eclectic streetlife. The Viaduct and Wynyard Quarter are both renowned for their cafes, restaurants, vibrant nightlife and harbour buzz. Britomart, with all its boutiques, city green spaces, bars and restaurants is just five minutes away. Sky City Casino and award winning bars, restaurants and cafes are also just a few minutes walk. Just five minutes drive to the main highway junction: choose to head north over the Harbour Bridge to stunning beaches and holiday resorts, West to our beautiful wild, black sand beaches such as Piha or South to famous Rotorua. A 10 minute drive or cycle will get you to Tamaki Drive renowned for famous waterfront and golden beaches, cafes and restaurants. A trip to Auckland isn't complete without a ferry ride to Devonport and a day on Waiheke Island - world famous for its golden sand beaches, vineyards, award winning restaurants and cafes. Heritage Apartment 338 has everything you need for an amazing CBD stay - whether you're here for business or pleasure. Person who books must be over 25 years of age and one of the guests staying. No more than 4 people allowed to stay. Guests must abide by the Body Corporate Rules which will be provided by the owner once the booking is confirmed. The covered deck is not to be used between the hours of 2230 and 7am (10.30pm and 7am). Extras: Cleaning and linen hire (Required, NZ$95.00 per stay); Linen (included). I'm lucky enough to live in one of the world's greatest cities and with family in London and NY, need no excuse to head to the other side of the world! My husband Roger and I got the travel bug five years ago (once we'd done our bit raising three daughters) and fell in love with Italy and the south of Portugal. At home we love boating, fishing, cycling and motorcycling (Roger 's thing) ... and are more than enthusiastic about our food and wine! The weekends will find us discovering new and old experiences in and around Auckland, or visiting our Coromandel bach for a spot of fishing, paddle boarding and casual entertaining. We love the large, sunny covered garden terrace, beautifully planted with quality outdoor furniture - perfect for al fresco dining. Our guests tell us this is one of the best apartments in the inner city - in particular they really appreciate the 'Insider's Guide to Auckland' we've put together; all our favourite things to eat, do and see in and around our gorgeous city. Privately owned and located in the Heritage Hotel which gives guests access to all facilities including rooftop pool, indoor pool, two gyms, tennis court, hot tub, tennis court and more. Fully equipped kitchen with full-sized fridge, stovetop, microwave, oven, dishwasher, quality glassware and dinnerware. Includes Nespresso coffee maker and a generous supply of capsules. Dine inside around the four-seater cafe table or al fresco on the large, sunny terrace, amongst magnolias and climbing jasmine. Spacious, sunny terrace garden, fully covered for protection from sun and rain. Includes outdoor dining area with table candles. Guests have access to full size court. Racquets available for hire. The apartment is in a hotel complex which is fully wheelchair accessible. The apartment has two bathrooms; one with a 'wheel-in' shower and separate tub, the other with a shower over the full-sized bathtub. Complex includes TWO spa pools. One is outdoors in the rooftop pool/gym complex and another in the indoor spa/pool complex. My friends and I had no idea what to expect once we arrived in Auckland. The apartment was better than expected. ?Everything was fresh, clean and airy! Jane even provided spices to go along with all the kitchen amenities!! We loved the apartment, building and location. We’d love to return one day. Sidenote: the tubs were just as good as those in spas! Apartment in a great location. It is lovely and clean with very nice decor. Appreciated the 2 pools and gyms. Thanks for the wonderful meal suggestions. Those that we experienced were spot on and delicious. Auckland is a city with lots to do and WONDERFUL food. Thank you for so graciously taking my phone call. Jo Ann, thank you so much for your kind words. It was an absolute delight to host you and I'm so pleased you found your way to some of our great restaurants. We love sharing our city and it makes my day when guests really get the most out of their stay. Come back again one day and explore some more! I highly recommend this VRBO... perfect location & excellent accommodations. We loved the location & accommodations. When we return to Auckland this is where we will stay! Great to hear you enjoyed your stay David. It was a pleasure to host you and of course there's a very warm welcome for you here any time. We hope you'll be back again soon! Apartment is very beautifully decorated in a modern style. Jane was helpful in getting us in a little earlier on our arrival day. Roof top pool area is a nice place to relax and from which you can watch people skywalk and sky jump from the Sky Tower. Some paving tile work was underway in outside open area below the room. Crew started jack hammering at 7:15 am one day, and we contacted Jane. She was quick to follow up with hotel, and it turns out the crew (not employed by the hotel/apartment complex, but company owning another building) had violated working hours agreement. The matter was addressed. Jane dropped by that afternoon to apologize for the inconvenience -- which we greatly appreciated. As construction work was minor, I suspect it will be wrapped up shortly. Great place to stay, and a very responsible owner. thanks so much for taking the time to write such a thorough and generous review. It was lovely meeting you all and a pleasure to host. You're right, the works are all but completed now and the contractors are back to working within restricted hours. Like many international cities, Auckland is undergoing a major facelift at the moment in preparation for the Americas Cup and the many visitors this will attract. The upside of the courtyard work is that all the new paving, planting and seating will create a really lovely outlook from our apartment's terrace. Beautiful apartment with everything one would need for a comfortable stay. Large balcony allows you to enjoy breakfast outside in nice weather. The rooftop pool and hot tub were a nice bonus. Jane and Roger are very pleasant and were always available to help with any and all questions. We just returned from our trip to NZ and really enjoyed our stay at this property. Everything was clean and modern and in a great location to the harbor filled with restaurants and shopping. Jane was great at responding to all my questions before our visit and offered her parking spot for our rental car which was extremely helpful. The entire process of renting was easy. Although right in the heart of the CBD, the apartment is quiet, sunny and set well back from the road above a beautiful, large internal courtyard. The Viaduct, Britomart and Wynyard Quarter - all renowned for their cafes, restaurants and harbour buzz - are within 10 minutes walk. Auckland Ferry Terminal is a short walk, as are Queen Street and Britomart which are filled with luxury boutiques and renowned local designers. The Auckland Art Gallery is 10 minutes walk. 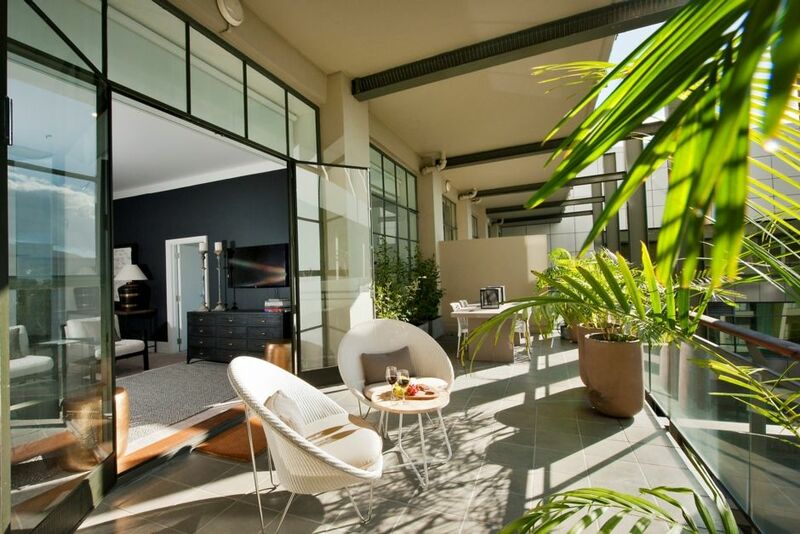 The apartment is absolute central yet provides true resort living right in the heart of Auckland CBD.